Ezekiel prophesies that after many days mankind would be “visited”. This is a term often used in the Old Testament when describing the coming of the Lord to the earth—especially with reference to His first or second comings. 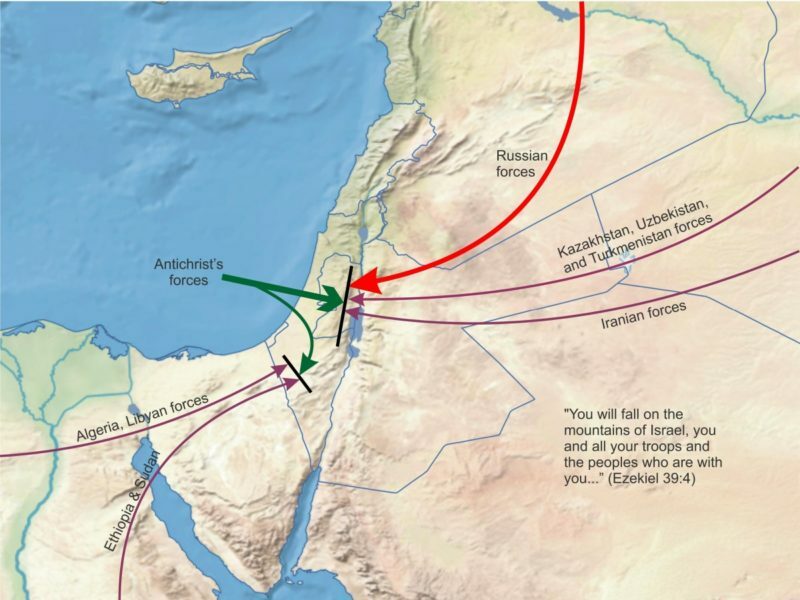 Ezekiel then goes on to say that in the latter years (e.g., in the years just before the Lord’s Second Coming) Russia and her allies will attack the land of Israel. At this point, the prophecy gets very interesting. Ezekiel describes Israel as a nation that will be regathered out of many countries. Specifically, he says that the Jewish people will come back to their land to escape “the sword”. Our generation indeed has seen Israel come back from the sword and persecution of World War II (see the chapter on Israel). At the time of their restoration, they were regathered out of many nations—nations where they spent thousands of years as exiles and wanderers. Even Ezekiel’s description of the land of Palestine as being a continual wasteland before the Jews returned is an accurate prophecy of what happened in 1948. No other generation could fulfill these prophecies. Only in our time has there arisen a Great Russian power to the north of a reborn nation of Israel having the very same allies that Ezekiel predicted. More amazing still is how, in verse 11, Israel is described as “the land of unwalled villages”. This one statement alone indicates that this prophecy could not have been fulfilled at any other time in history. In every other case that Israel existed as an independent country, they have always built their cities with walls surrounding them. In ancient times, this type of defense was an absolute necessity. The best protection against an invading army was a city built like a fortress. Today such fortifications wouldn’t hold back even the most meager of armies. Even though Israel has built a wall around the Palestinian areas to avoid easy terrorist attacks, their cities remain unwalled. Only the Lord could have foreseen a time when the military capabilities of man would have made walled cities obsolete. When Israel became a nation in 1948 the new government didn’t even consider building walls around their cities. Even though the nation was born in the most dangerous time in Jewish history, they knew that walled cities wouldn’t help. Notice also in this chapter that in almost the same breath as Ezekiel describes the Russian invasion, he also indicates that a form of peace will come to Israel just before the end. The reference to Israel dwelling safely seems to imply that the constant threat of war in the Mideast will temporarily cease just before Magog decides to attack. This could only refer to the brief “peace and safety” of the Antichrist’s kingdom which will have extended even to the troubled Arab-Israeli conflict at that time. The first part of Daniel’s 70th Week will be marked by a temporary peace that will envelope the entire world (see the chapter on Israel). When the nation of Israel finally finds herself dwelling safely, the Lord says that their prosperity will only serve as a temptation for Russia to attack. Obviously, the old animosities between nations will not completely die out during the Antichrist’s reign but will only be buried for a brief time in the euphoria of the new world order. At the end, when Egypt and Syria attack Israel after the abomination of desolation occurs, the false peace of the last days will be broken with incredible violence. Ezekiel says that Magog will then descend upon the Middle East “like a cloud to cover the land” (Ezek. 38:16). The Russian alliance will come with all the forces they can muster. In our time, the Western Alliance always has expected Russia to attack west through Europe. The Bible, however, says that they will launch their offensive directly south toward the Middle East. Sheba and Dedan were ancient countries which existed thousands of years ago in the southern Arabian desert. Today this territory holds the bulk of the Arab oil reserves, a resource that is becoming more important as time goes on. The Saudis and the other Arabian countries will be shocked when Russia launches its attack. They will quickly realize, however, that the Russian alliance has no intention of fighting on the side of the Arab cause in the Middle East, but are after direct control of the oil fields. Ezekiel indicates that the primary purpose of the Russian invasion will be “to take a spoil, and to take a prey” (Ezek. 38:12). One evangelist once said that the spoil they will be after can easily be discovered by spelling the word “spoil” (S…P…OIL). With the recent discovery of massive natural gas fields off the Mediterranean coast of Israel and another massive shale oil discovery in the valley of Jezreel (Armageddon), the petroleum riches of the Jewish nation also will be a temptation for Russia (see Israel a Middle East Energy Giant?). Is it just a coincidence that the shale oil field is in the exact spot where the Battle of Armageddon will be fought (Rev. 16:16)? This oil deposit equals or exceeds the total petroleum reserves of Saudi Arabia. A superpower fight for the Middle East oil fields has long been a probable scenario to spark World War III. When the armies of the Antichrist enter the Middle East to counter-attack the Syrian and Egyptian attacks at the end, the Western Alliance will be too close to controlling the world’s greatest sources of energy. Russia cannot let that go unchallenged. The initial reaction of the Western Alliance to the Russian invasion can be found in the reference to the nation of Tarshish. This nation was a prolific trader with Middle Eastern countries throughout Old Testament times. Goods coming over land routes from all the empires of the east would flow into major port cities like Tyre and then be shipped out to far away consumers by sailing ships. The country of Tarshish actually represented the furthest western limits of known civilization. The exact region that Tarshish occupied has been variously interpreted as being either Spain or Britain. In either case, the distinct reference to this country indicates that the future western nations will react much the same as the Arabs. Even though the Antichrist will have subdued Syria and Egypt by the time of the Russian attack, it appears that the oil-bearing nations will quickly realize their greater enemy and join forces with the West. Ezekiel says that the Western nations and the Arabs will jointly react to Russia’s attack with the question, “Have you come to take a spoil?” The first response to the Russian mobilization will be to send out rapid diplomatic messages to avoid the conflict. Most probably, under the treaty establishing the one-world government, Russia will have no justification for the attack. Under the provisions of the future treaty establishing the New World Order, the forces of the Antichrist will have every right to intervene in the war. At the time when Syria and Egypt attack Israel, the empire of the Beast will be merely enforcing the peace of the world by intervening in another Middle East war. This is why the West’s initial reaction will be one of surprise and shock. How can Russia risk ruining the greatest empire mankind ever formed? How can they chance starting World War III after 3-1/2 years of the best attempt at peace man has ever known? All the diplomatic maneuvering in the world will not be able to stop the mad rush toward war. Because of the evil of the Empire-Beast and the arrogant act of the Antichrist in declaring himself to be God, the Lord himself actually will help these events move forward. Ezekiel says that God will supernaturally draw the Russian bear down to the Middle East to do battle. He figuratively says the Lord will put hooks into Magog’s jaws and pull him down toward the nation of Israel (Ezek. 38:4). Russia will have no choice. The Lord will use the hatred and animosity which has been built up over the years between the East and West to bring the world to the very brink of Armageddon. “You will fall on the mountains of Israel, you and all your troops and the peoples who are with you; I will give you as food to every kind of predatory bird and beast of the field. You will fall on the open field; for it is I who have spoken,” declares the Lord God. And I will send fire upon Magog and those who inhabit the coastlands in safety; and they will know that I am the Lord. The Lord also says that fire will be sent upon Magog as well as the people who inhabit “the coastlands”. This is a phrase used in the Bible that essentially refers to people dwelling afar off in nations that could only be reached by seagoing vessels. This is the first indication that this war will go nuclear and result in the destruction of Russia and large areas of the Antichrist’s kingdom (more on this later). In addition, once the Great Tribulation begins, these events will so spiral out of control that every nation will rise up to the battle. During this time, evil and destruction will be totally unrestrained by God (2 Thess. 2:7) and the true and full evil of man will dominate the world right up until the Return of Christ. The final battle thus will begin as a limited Middle East war, just as so many have started in our generation, but it will quickly spiral out of control into a superpower confrontation the likes of which the world has always feared. In fact, Russia and her allies are not the only major power predicted to enter the war. Remember, Daniel told us that the Antichrist will also hear “tidings out of the east” that will “trouble” him.